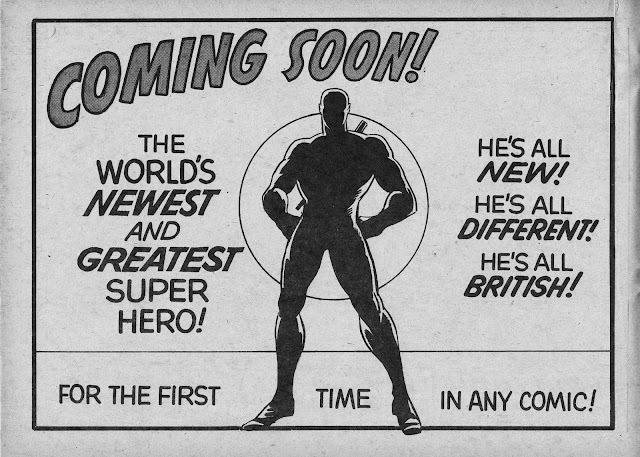 This MARVEL UK House Ad, from SUPER SPIDER-MAN AND THE SUPER HEROES (phew) issue 189 (22 September 1976), is - believe it or not - the first glimpse of CAPTAIN BRITAIN. Yup, despite looking nothing like the character that would emerge only a month later, this was a teaser for Marvel's purpose-built (by - ahem - US creators) British hero. It looks like Storm Shadow. The Bullpen were very keen to keep the design under wraps? CB was originally going to have a very different look... and a sword? With a month to go before launch, Stan and co. still hadn't settled on a design? I'm not really sure... but it's a fun find. BTW: It's a landscape add because - of course - SUPER SPIDER-MAN was living through the Titans Format era. I don't understand what you mean, he's all in shadow so you can't really say that he looks different from the final outcome and that thing on his back is his staff,isn't it? What I remember is that M-UK would only say that his initials were CB and I thought oh no, please don't call him Captain Britain ,that's so corny ! Of course they did and I bought the comic anyway. The biggest disappointment for me was the FF in black and white while Nick Fury was in colour, I'd have preferred it the other way round ( or the whole comic in colour of course). Good point about the staff. And I think I see what you mean. Although, to me, the silhouette doesn't look 'right' to me. When I first stumbled across the page I never thought "wow, Captain Britain". It reminds me of Snake Eyes so maybe that's influencing me unduly. I'm guessing that they put the SHIELD strips in colour because they wanted to showcase Sterenko's great art. The colour printing is pretty good in CB, especially compared with the debacle of the 1983 colour experiments in THOR, X-MEN and the revived MWOM. It's amazing they passed anyone's quality control. Actually, I was a bit unfair as the silhouette's head is smooth and CB had a blond coiffure, you are right to say it doesn't look quite right which is strange a mere 3 weeks before launch. Perhaps the figure had been drawn several months earlier by somebody who wasn't fully in the know, a sort of generic super-hero silhouette ?